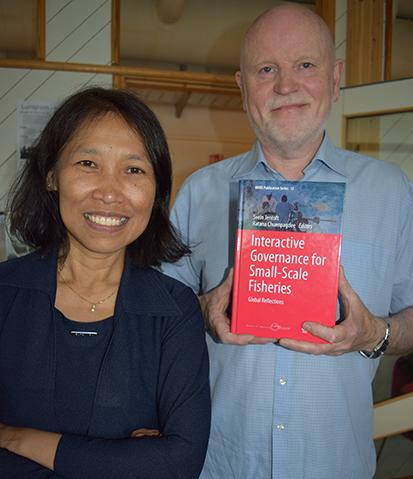 Svein Jentoft (The Norwegian College of Fisheries Science) and Ratana Chuenpagdee (Memorial University) release an 800-page book titled “Interactive governance for small-scale fisheries: global reflections”, published by Springer. The book is an edited volume of 35 case studies from around the world, written by 70 authors, all applying the same theoretical governance framework to examine challenges facing small-scale fisheries and explore avenues for improved governance. The book is a unique contribution to the discourse about fisheries governance, offering lessons and reflections about types, forms and functionality of governance and governing institutions that are most suitable to certain fisheries contexts. Taken together, the case studies highlight how some governance arrangements are far more sensitive to small-scale fisheries situations, and are more conducive to capitalizing on opportunities that exist therein. Ratana Chuenpagdee and Svein Jentoft with their new book. The situation and prospects of small-scale fisheries are drawing growing international recognition, given their role in poverty alleviation and food security globally, particularly in the south. Small-scale fisheries are also the sector that employs more than 90 percent of the people within the fisheries industry, with the overwhelming majority living in Asia and Africa. Small-scale fisheries contribute to ecosystem stewardship, often with fishing communities initiating and participating in conservation. Still small-scale fishing people are typically marginalized and vulnerable, for instance due to their exposure to climate variability and change, as well as to globalization. Addressing issues affecting small-scale fisheries requires large-scale, concerted efforts from all actors, including research communities. In-depth, systematic studies of small-scale fisheries, conducted across regions in different contexts, presented in this volume, offer a solid platform on which more sustainable and socially just fisheries governance systems can be built. The book should be read also in the context of the Voluntary Guidelines for Securing Sustainable Small-Scale Fisheries, endorsed by FAO member states in 2014, and is a timely contribution to the implementation process of these guidelines. The book is a direct outcome of the global partnership for small-scale fisheries research called Too Big To Ignore, funded by the Social Sciences and Humanities Research Council of Canada. For more information about the project, visit toobigtoignore.net. Jentoft and Chuenpagdee together with chapter writers at the book release at the MARE conference in Amsterdam in July.